Sea shells on blue ceramic electric simmer pot. Electric ceramic simmer pot/warmer in dark green with marbling. 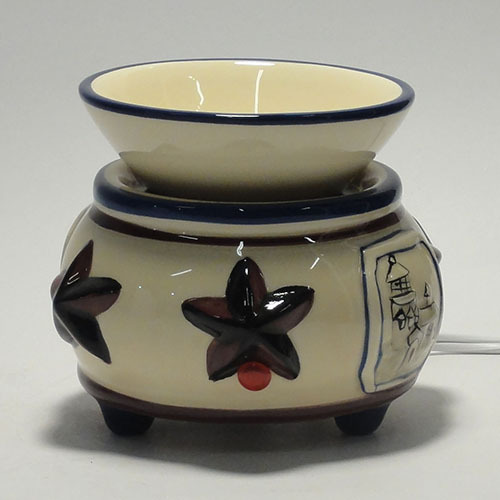 Electric ceramic simmer pot/warmer in navy in color. Electric ceramic simmer pot/warmer burgandy in color. Electric ceramic simmer pot/warmer ivory in color. Electric ceramic simmer pot/warmer black in color. Electric ceramic simmer pot/warmer brown in color. Electric ceramic simmer pot/warmer with yellow daises. Beige and blue ceramic electric simmer pot with maple leaves and cottage. Lilac on beige ceramic electric simmer pot.